Emotional Support Animals vs. Service Animals - What's the Difference? Emotional support animals can be any common domestic animal that abides by typical pet standards - i.e. is house-trained, understands basic commands and is safe to be around other people and pets. In order to be considered a legal Emotional Support Animal, the presence of the animal must be deemed necessary by a licensed medical professional. This means that the pet provides necessary relief from a debilitating mental condition. There are no official standards for determining what training an emotional support animal might receive and they are often not officially trained in any capacity. In the last several years there has been a significant increase in the number of animals labeled as therapy or emotional support dogs that have no training or indication of need from a mental health professional. There are numerous websites now that you can pay a small fee and receive an official-looking certificate and a vest that says service or support dog. While unscrupulous, these websites do not break any laws; though the use of vest inappropriately could get a pet owner into some legal trouble. Service animals are defined by the American with Disabilities Act as dogs that are individually trained to do work or perform tasks for people with disabilities. These dogs are bred and selected for their calm personalities, adaptability, and ability to learn complex tasks. They go through a rigorous training process and many dogs do not pass the final tests to qualify as a service dog. Service dogs are allowed to go anywhere their owners can and they cannot be barred from any area that the public is typically allowed to go. 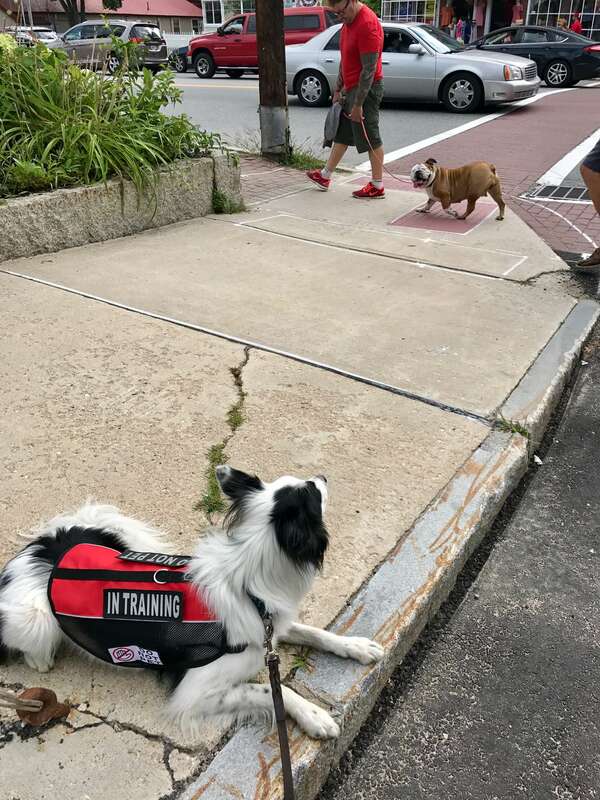 If it is unclear what service a dog might perform staff is only allowed to ask two questions: 1) If the dog is a service dog required because of a disability and 2) what work or task the dog has been trained to perform. These restrictions, while meant to protect people's privacy, are one of the reasons that it is easy for people to bring pets or untrained emotional support animals into public areas. Businesses or individuals are often hesitant to questions a pet's presence for fear of offending someone or even breaking the law. Although it may make you more comfortable to have your pet with you on a flight, studies have shown that untrained pets can become quite stressed during travel even without significant outward signs. Some shops welcome well-behaved pets regardless of whether they are a service animal or not. Consider adding routines to your days or weekends so that your pet knows when to expect fun activities such as walks or other outdoor adventures. We all love our pets and want to spend as much time as possible with them. It's just important to remember what's best for your pet and safest for the rest of the community when you consider bringing your pets with you on errands or other outings. If you would like to explore ways to enrich your dog's life or make outings more enjoyable and safer for all involved, please call us today. Our experienced staff love to discuss ways to improve life for pets and their parents, alike.